What is the new food assessment tool for food tank cleaning stations? It is a standard that is based on the existing tank cleaning SQAS (Safety Quality Assessment System) questionnaire, but we have added questions that are specifically tailored for the assessment of the quality of food tank cleaning stations. Why is it needed and who will use it? The incentive for this EFTCO initiative was triggered by the increasing number of audits undertaken by food companies of tank cleaning stations. The food sector became aware that almost everything in the transport chain was controlled, except the important step of the tank cleaning before loading. A standard for this process did not exist, so we felt it crucial to develop one. Our members saw the same trend in the past in the chemical industry, where companies conducted their own audits to approve tank cleaning stations before loading chemicals. We perceived that they gained confidence in Cefic’s tank cleaning SQAS (Safety Quality Assessment System) by eventually accepting these assessment reports and stopping their own audits. I do not need to tell you that this saved them and the tank cleaning stations a lot of time and money. This is exactly what we hope to achieve with our food assessment: we want it to be cost-effective, continuously improved, and performed by independent and capable assessors. Needless to say confidence amongst food companies can only be achieved when the credibility of the assessors is undisputable. We therefore decided it was important to use existing SQAS accredited assessors. Training of these assessors in food standards is currently underway. How does it compare with the SQAS system? The SQAS core and tank cleaning questionnaire is an integral component of the new EFTCO food assessment, and we are very grateful to Cefic for allowing us to use it. EFTCO has tailored Cefic’s SQAS by using a workgroup of food cleaning specialists to develop questions that are very specific to the cleaning of food tanks. We estimate that the extra assessment time required will be around half a day in comparison to the time required to complete a standard SQAS. Just like in SQAS, assessors will use a 1 or 0 to indicate if an item has or has not been implemented, respectively. The assessor can also add comments or upload files. After their report is complete, the tank cleaning station can add comments or upload an improvement plan if desired. What are the key features and benefits of the assessment? This is the first standard of its kind. We felt that an assessment for food tank cleaners was needed so the obvious benefit is – there is now one out there. In addition, EFTCO represents 468 tank cleaning stations throughout Europe, so we hope it should be fairly easy to roll it out. When this assessment is widely accepted by the food industry, we believe it will create a win/win situation for the tank cleaners, food industry and logistic service providers. EFTCO has started the ball rolling and is now liaising with food manufacturers to educate them on the benefits of it. The food assessment is a very flexible system, integrating the demands of all involved parties. New EFTCO cleaning codes can also be added to cover the information needs on the European Cleaning Document (ECD), so only one document is needed for the documentation of the cleaning process, making it instantly understandable in 18 European languages. EFTCO has also developed a protected EFTCO food logo, which is reserved for tank cleaning stations that have a valid food assessment. By printing this logo on the ECD, the user can see that the cleaning was undertaken in a station that has met high quality standards. Another advantage is that the same ECD can be used for food as well as for chemical cleanings. The food logo provides a clear differentiation between food and chemical cleanings. How will the new food assessment be implemented? With the support of some very talented web developers, EFTCO has launched a new website for users of the food assessment system, which I believe is easily accessible, simple to use, attractive and secure. The website has publicly accessible and password-protected sections. All member cleaning stations, assessors and users can use the system by requesting a username and password via the website www.eftco.org or by emailing secretary@eftco.org. The public section will display a list of SQAS assessed companies or EFTCO food assessed companies. It will also allow interested parties to search for tank cleaning stations by area. The secure areas will host the food assessment reports, which users can request access to and tailor to their needs. This will, however, be carefully controlled by EFTCO. 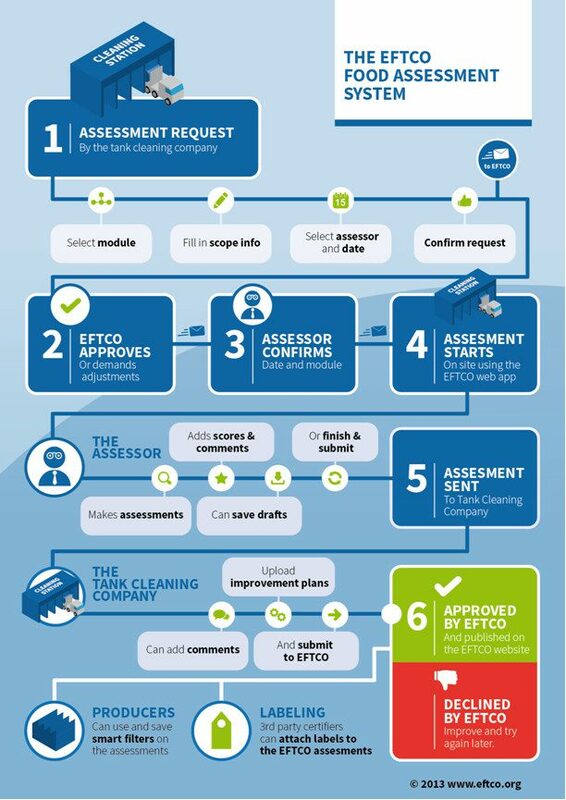 The EFTCO food assessment process is illustrated in the infographic that can be accessed here. We welcome comments or improvement suggestions on the new system so please do let us know what you think! This entry was posted in Equipment & Technology, Feature Interviews. You can post a comment.